BearsGrid is an amazing and powerful WordPress plugin designed to help you display your portfolio projects, gallery images, works, team members in an elegant style! It is ready with 4 custom post type: portfolio, project, gallery, team. 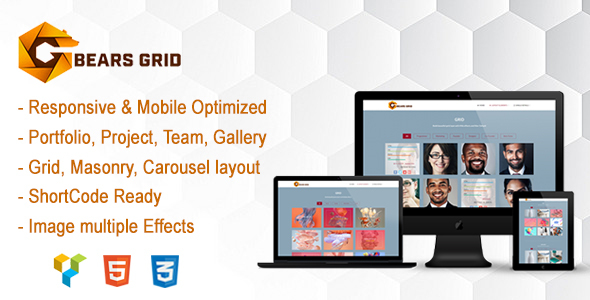 Beside BearsGrid ready with multiple nice effect layout for Grid, Masonry, Carosel. It is become with creative and multiple for single detail layout and support option filter for your idea. The overall minimalist coming near is the one of BearsGrid key point besides consumer-friendly experience and flexible layout. You will get all elements to use with Visual Comporse Page buildes or use shortcodes without Visual Comporse. Discover today !